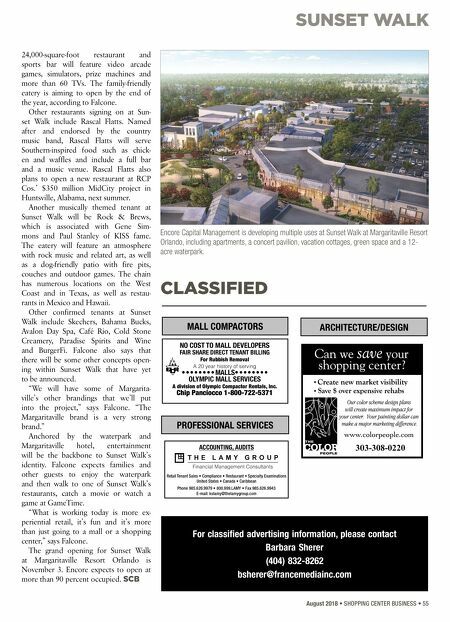 SUNSET WALK 54 • SHOPPING CENTER BUSINESS • August 2018 D eveloper Art Falcone is spear- heading a fair share of Florida's top mixed-use projects. In addi- tion to being one of the principals of the $2 billion Miami Worldcenter develop- ment, Falcone's company, Encore Capital Management, is underway on Plantation Walk in Broward County and Beachwalk in Jacksonville. 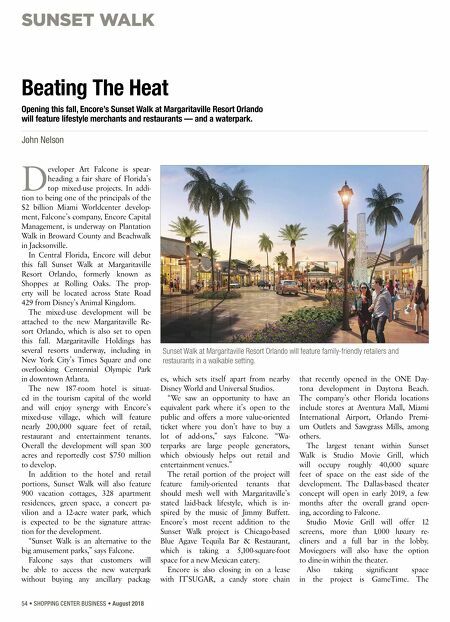 In Central Florida, Encore will debut this fall Sunset Walk at Margaritaville Resort Orlando, formerly known as Shoppes at Rolling Oaks. The prop- erty will be located across State Road 429 from Disney's Animal Kingdom. The mixed-use development will be attached to the new Margaritaville Re- sort Orlando, which is also set to open this fall. Margaritaville Holdings has several resorts underway, including in New York City's Times Square and one overlooking Centennial Olympic Park in downtown Atlanta. The new 187-room hotel is situat- ed in the tourism capital of the world and will enjoy synergy with Encore's mixed-use village, which will feature nearly 200,000 square feet of retail, restaurant and entertainment tenants. Overall the development will span 300 acres and reportedly cost $750 million to develop. In addition to the hotel and retail portions, Sunset Walk will also feature 900 vacation cottages, 328 apartment residences, green space, a concert pa- vilion and a 12-acre water park, which is expected to be the signature attrac- tion for the development. "Sunset Walk is an alternative to the big amusement parks," says Falcone. Falcone says that customers will be able to access the new waterpark without buying any ancillary packag- es, which sets itself apart from nearby Disney World and Universal Studios. "We saw an opportunity to have an equivalent park where it's open to the public and offers a more value-oriented ticket where you don't have to buy a lot of add-ons," says Falcone. "Wa- terparks are large people generators, which obviously helps out retail and entertainment venues." The retail portion of the project will feature family-oriented tenants that should mesh well with Margaritaville's stated laid-back lifestyle, which is in- spired by the music of Jimmy Buffett. Encore's most recent addition to the Sunset Walk project is Chicago-based Blue Agave Tequila Bar & Restaurant, which is taking a 5,100-square-foot space for a new Mexican eatery. Encore is also closing in on a lease with IT'SUGAR, a candy store chain that recently opened in the ONE Day- tona development in Daytona Beach. The company's other Florida locations include stores at Aventura Mall, Miami International Airport, Orlando Premi- um Outlets and Sawgrass Mills, among others. The largest tenant within Sunset Walk is Studio Movie Grill, which will occupy roughly 40,000 square feet of space on the east side of the development. The Dallas-based theater concept will open in early 2019, a few months after the overall grand open- ing, according to Falcone. Studio Movie Grill will offer 12 screens, more than 1,000 luxury re- cliners and a full bar in the lobby. Moviegoers will also have the option to dine-in within the theater. Also taking significant space in the project is GameTime. The Beating The Heat Opening this fall, Encore's Sunset Walk at Margaritaville Resort Orlando will feature lifestyle merchants and restaurants — and a waterpark. John Nelson Sunset Walk at Margaritaville Resort Orlando will feature family-friendly retailers and restaurants in a walkable setting.